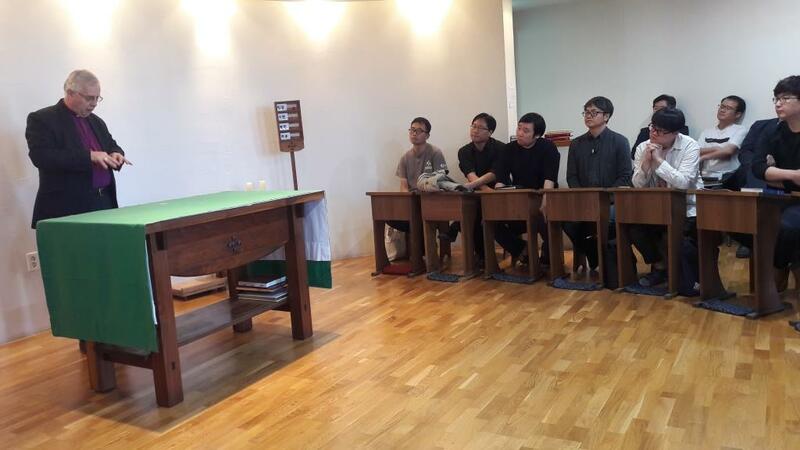 Bishop Donald addresses the ordinands at Seoul’s Anglican University. Four members of the Diocese of Peterborough staff team are in South Korea for a ten day trip to visit the Diocese of Seoul. The team – Bishop Donald, Revd Canon Tim Alban-Jones (Vice Dean of Peterborough Cathedral), Revd Canon Sarah Brown (the Cathedral’s Canon Missioner) and Becky Wills from the Gen2 team – flew out on Monday 1st October and will return to the UK on Wednesday 10th October. While visiting the Anglican University in Seoul, Bishop Donald was invited to talk to the seminarians (ordinands) in training. There are currently 16 seminarians at the university who all have to attend a three-year course. Bishop Donald spoke to them about the importance of working collaboratively with the laity and how, as co-workers in the body of Christ, clergy and laity together should proclaim the Gospel in word and deed. The President of the university, the Reverend Dr Amos Kim, also spoke about the possibility of bringing a group of students from the university over to the Diocese of Peterborough in the coming years as a further way of strengthening the link between the two dioceses. The Bishop of Seoul, Peter Lee, paid a three-day visit to Peterborough in January this year, and it is therefore hoped that the visit by the diocesan staff members will continue to strengthen the link between the Dioceses of Peterborough and Seoul, which has been in place in 2011.